Hi, my name is Nazifa and I am a junior at JR Tucker High School in Henrico, Virginia. This is my first year in Y Street and it has been a fun learning experience. I have gained experience communicating with people and answering questions from all different types of people. I have learned that our school takes great pride in being tobacco-free. 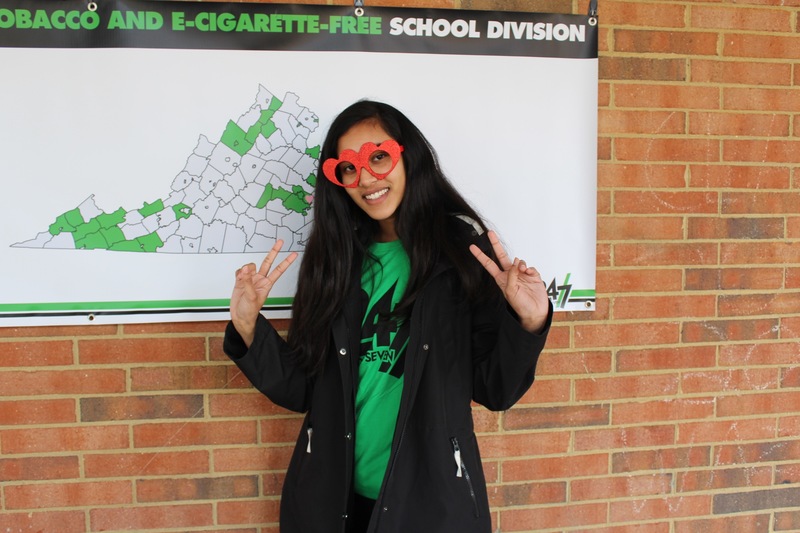 On February 14 my school celebrated Tobacco-Free Spirit Day. We helped to promote the 24/7 campaign and I really enjoyed it. I’m very proud that our school stands behind such a great and powerful message and is dedicated to making our school 100% tobacco-free. I had the opportunity to lead the day as a Tobacco-Free Spirit Day Captain. With the help of my fellow Y-Sters, we set up a table outside of our cafeteria and made sure everything was neat and organized, which was fun. I liked the whole pre-event process. My YFO, Janice, had been very helpful in communicating with me and helping me get everything needed for the event set up along with Mrs. Johnson, our advisor, who helped us by providing us with extra materials. My friend Mikhayla, who is another Y-Ster, also helped set up the event. We had a lot of fun decorating the table and taking photos with other Y-Sters who helped, like Caleb and Hunter. Interacting at the event was really fun. My school is one of the most diverse schools in our county, so there are lots of different people with unique views and opinions. I liked talking with my peers about our campaign and our youth group, which is working hard to keep our school 100% tobacco-free. One conversation I had was with my friend Meron. We started talking because she was interested at first sight. She filled out a survey and we talked about how us Y-Sters are trying to promote our 24/7 campaign and working to make our school 100% tobacco-free. She was so inspired that she actually started helping us recruit people. She was sad that she hadn’t applied to Y Street because it looked like a fun and powerful thing to do. I loved seeing students at our school get excited about taking pictures and winning prizes. We had lots of success filling out surveys and people were eager to do it. I was surprised that students weren’t the only ones getting involved, but teachers and even the principal. It made me happy that people were proud of our school being a 100% tobacco-free environment, and I think all together we can help other schools be 100% tobacco-free too. One of the best things about Tobacco-Free Spirit Day was that by the end, my friends were interested in joining Y Street because they saw the great impact we had created. We want to make Virginia a healthier and better place to live in. I hope to create a chain reaction that starts with me affecting someone else. Y Street has affected me and I hope to spread awareness.